I was always terrified of birth. I remember asking my mom when I was about 11 or 12 why my aunts had to have IV and machines hooked to them and have the ‘needle’ in their back or surgery. I remember asking my mom if that was how we all have babies. I remember telling her I never wanted to have a baby if I had to have one that way. It wasn’t until after I got married and moved to England when I was 20 (in 2004) that I realized that women have options and not all women are drugged and hooked up to machines. I loved to watch the British reality show about midwifes it was really nice to see women birthing naturally. I also Loved the documentary ‘The Business of being born’ from then on I knew I would never give birth in a hospital or have an OB deliver my baby. My husband and I moved back to Texas a few years later. 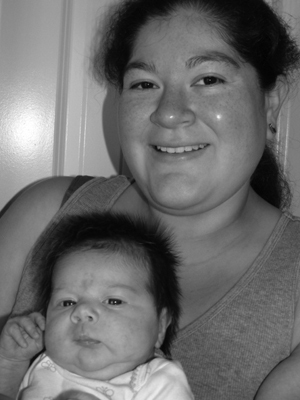 When I became pregnant I already knew I would have Darlene as my midwife. I had spoken to her 2 years earlier when my husband and I decided to have a baby. She made me feel comfortable and I felt we were on the same page of what I wanted for my birth. I felt safe and loved being pregnant I had no worries even though my blood pressure was a bit high. Darlene was great with prenatal care I managed to lower my blood pressure and stabilize it with natural herbs in “Blood Pressurex”. She advised me what types of vitamins I and supplement my body needed. I had a pretty easy pregnancy. On October 18, 2010 my dog, Jerky, was whining and woke me up at 3:00am! I thought he needed to go outside to pee, as soon as I stood up my water broke! I was shocked because I was 2 weeks early! I woke my husband up and called Darlene, since I wasn’t having contractions yet she advised me to get some sleep and she would call in a couple of hours. So I went to bed and tried to sleep but I couldn’t. All I kept thinking of is I can’t wait to see my baby and Oh my goodness my father in law is going to be here when I give birth (He was visiting from England).About half an hour after my water broke I started having contractions. They were not painful so I stayed in bed. About 15 minutes later they became more frequent and more painful. That’s when I called Darlene. I spent most of my time walking and sitting until Darlene and her assistant arrived around 11 am. When she got here she did an exam and I was already 5 centimeters dilated and almost completely effaced. My 12 year old sister and mom came to see me around 1 pm. It was like a party so many people in our house. My mom stayed for lunch and went back to work. Around 2pm I was ready to get in the tub! My husband and sister went in with me. It was amazing how my body just did what it had to do. There was no way stopping it! I pushed for about 20 min and my beautiful baby girl was born at 3:00pm sharp! 12 hours of labor. By 7 pm we were all having dinner celebrating our little Charlotte Melissa Wilkins she was 6lbs 5 ounces. And 19.5 inches long. This birth was amazing I couldn’t have asked for a better birth J I hope Darlene will be available for my next birth.